Rather than giving you yet another strip of useless fabric that will end up as rubbish, we’ll be handing out lanyards for your Fixfest name-badge/programmes that you’ll actually be able to use again. 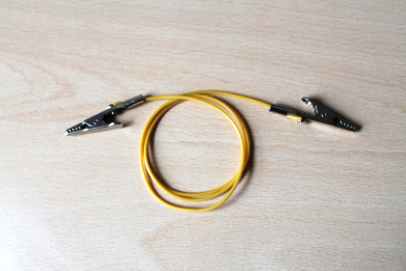 Insulated alligator clip electrical cables can be used for all sorts of things: as test leads, for holding objects when soldering them, or – with a small modification – for discharging capacitors (see below). If you don’t think you’ll use your lanyard again, we’ll gladly take it back off you at the end of the festival for use at our repair events. It’s easy to modify the length of your lanyard and learn some basic repair skills in the process. We’ll have instructions on-hand at Fixfest to show you how to do this – and Restarters to help if you get stuck – but it’s very simple! All you need is a screwdriver and a tool to cut and strip the wire. For those who want to go the extra mile, you can even add a resistor, turning it into a tool to help you repair more safely, and teach others to do the same. Many household appliances and mains devices have capacitors, which can carry charge. Capacitors must be responsibly discharged otherwise they pose real risks. The resistor works by allowing the energy in the capacitor to be dissipated as heat. Current flows from the more positive terminal of the capacitor, down the wire and through the resistor, back into the negative terminal. As this current creates heat, the voltage of the capacitor drops because it is storing less charge.